Manny Machado has signed the biggest free agent contract in American sports history after agreeing a 10-year deal with San Diego Padres. The $300m (£230m) deal has an opt-out clause in five years but if he completes the contract it would be the most lucrative in Major League history. The Padres described the 26-year-old infielder as "a generational talent". "We're ecstatic he's chosen to spend his prime years in a San Diego Padres uniform," they said in a statement. 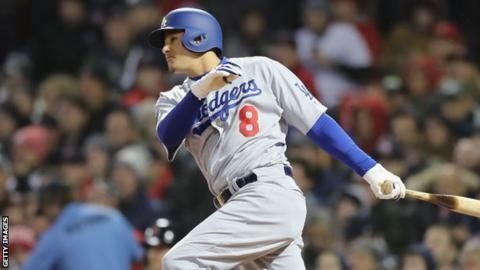 Machado, who was the number three overall draft pick in 2010, played for both Baltimore Orioles and Los Angeles Dodgers last season. The four-time All-Star played for the Dodgers in the World Series, where they were defeated by Boston Red Sox. He hit a combined 37 home runs between the Orioles and the Dodgers - tying a career high - but his 107 RBIs were a career best by 11. Machado has a .282 career batting average over 962 games, with 175 home runs and 513 RBIs. He is a two-time Gold Glove Award winner and finished fourth in the 2015 American League MVP voting.